Congressional Cemetery, 6:30 pm on an evening in Late March. After a life-affirming day at the March for Our Lives in downtown D.C., a pivot to spend the evening at a cemetery--Congressional Cemetery on the southeastern edge of Capitol Hill. The reason: a concert by Dead Men's Hollow in the cemetery's chapel. This wonderful band, together more than 15 years playing bluegrass and bluegrass-inspired music, performed one its last concerts. The cemetery has been on my to-visit list for a while, so it was a great excuse to meander beforehand. Congressional Cemetery indeed has many members of Congress (the most recent one we saw for Stephen Solarz, 2010), although it is not a federally owned cemetery like Arlington. It began as a parish burial ground, gradually adding more land and more graves--more than 65,000 at this point on (or mostly under) 35 acres of land. Congress bought sites to bury members, given that it was more or less the neighborhood cemetery for Capitol Hill, and funded some roads and other improvements.. I am reading Sidney Blumenthal's Political Life of Abraham Lincoln now, and had just read chapters on John C. Calhoun, Democrat from South Carolina, and Henry Clay, Whig from Kentucky: "he [Calhoun] hated Clay, hated him with visceral intensity, hated his harm, his ambition frustrating his own ambitious, and would hate his policies, which he had previously advocated." The two are buried next to each other. 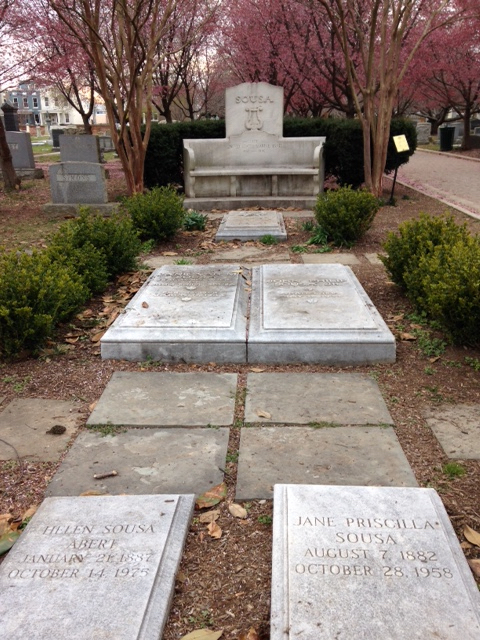 Many generations of Sousas are buried together, starting with John Phillip who lived nearby. J. Edgar Hoover is buried there. A dog-walker noted that Clyde Tolson is buried nearby, but in a hidden way. Docents regularly lead general and "themed" (Civil War, LGBT) tours. The cemetery was the place to be buried especially in the 1800s. In the 1970s, drug dealers had taken over. A saving grace was to open the cemetery, for an annual fee, to neighborhood dogs and owners. They help fund maintenance and also ensure a steady stream of visitors. Concerts, a book club, and the occasional special event also bring people in. And burial plots are available.